Everyone loves a good musical collaboration: fans get to hear some of their favourite artists together, the artists get to try something new and record companies make loads and loads of money. The Flaming Lips are a much-adored indie band with fans across the globe. Miley Cyrus is an ex-Disney Channel starlet turned pro attention seeker, and is best known for swinging about on a wrecking ball naked. The collaboration didn’t end there, either. Cyrus and The Flaming Lips called up another unlikely collaborator, Moby, and produced this bizarre video. Stan is one of the biggest rap songs ever, and at the time this collaboration didn’t seem too weird (mainly because no-one actually knew who Dido was). Shortly after releasing Stan, however, Dido became known for inoffensive pop ballads about cups of tea going cold and not putting up white flags by her door (a great home design tip, by the way). In hindsight, this collaboration was like Frankie Boyle and The Queen teaming up for an evening of comedy. Now this one really is weird. In 2000, Queen, one of the world’s most respected bands, decided to re-record their rousing anthem We Will Rock You with the boyband Five. To this day, no-one can explain why. Even watching the video is a bit like reliving a half-remembered bad dream. Fortunately, this crime against music disappeared without trace shortly aft…oh no, wait, it hit number #1 in the charts. Despite racking up more hits than a Buzzfeed article about Jennifer Lawrence cuddling kittens, poor Phil gets a hard time for being a bit dull. In 2003, however, Phil’s street cred got a minor boost when he teamed up with hip-hoppers Bone Thugs-n-Harmony on Home (which sampled his hit Take Me Home). Sadly, the song didn’t do too well in the charts and we never got to hear the unique hip-hop stylings of Big Philly C (as no-one called him) again. Yep, this really did happen. 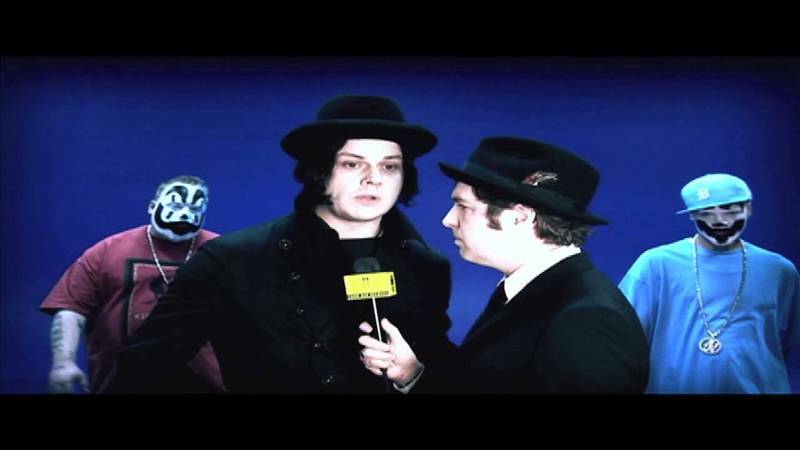 Jack White worked with the Insane Clown Posse (who are best known for wearing silly make-up and spraying root beer over their fans) on a cover of a 230 year-old Mozart song. Just let that sink in for a moment. Oh, and the song is about bums too. Y’know, in case the whole Jack White, Insane Clown Posse and Mozart thing wasn’t weird enough already. The Prince of Darkness has made some odd decisions over the years (including biting the head off a live bat), but none seem quite as weird as covering Born to Be Wild with Miss Piggy. Have we missed your favourite weird musical collaboration? Share it with us in the comments! If you’re looking to clean up your music collection, sell your CDs with musicMagpie (check out what other people are selling right now by clicking this link). ← The Greatest Greatest Hits Albums Ever!